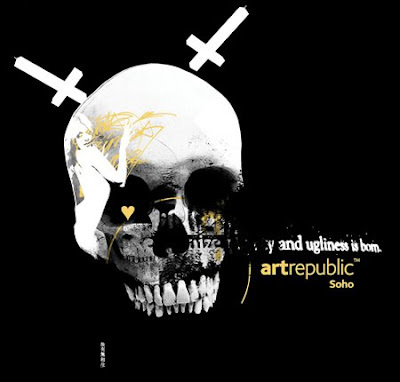 artrepublic Soho is launching an exclusive exhibition entitled ‘Saints and Sinners’ showcasing at St Martins Lane hotel. The independent Soho gallery has selected over thirty pieces from artists around the world, transforming the ‘front room’ of London’s original boutique hotel into an urban space. Over twenty up and coming artists are providing original pieces for the show with most creating specially commissioned work. Highlights include a ‘never seen before canvas’ by the highly acclaimed Nick Walker. Many artists will be flying in to attend the preview of this one-off exhibition. Artists from America include Adam 5100, Logan Hicks, Mr Brainwash and Broken Crow. Lidia de Pedro will be representing Spain and from France emerging artist C215. From Irish shores is Asbestos, from Italy Sten & Lex and one to watch out for Kosiec from Poland. Iconic International artists include Blek Le Rat and D*Face. Other well known names are Missbugs, Pure Evil, Charming Baker, Mau Mau, Eine, Nick Georgiou and the British Collective Static. A private viewing will take place on Monday 10th November with the show opening to the public on Tuesday 11th and running until Friday 21st November 2008. ‘Saints and Sinners’ will be open for viewings between 12:00-22:00 with direct access through St Martins Lane hotel reception.